An extraordinary galaxy cluster, known officially as SPT-CLJ2344-4243, was recently discovered. Astronomers have dubbed it the "Phoenix Cluster" because of the constellation where it is found and because of its remarkable properties. These notable features include the highest rate of star forming ever seen in the center of a galaxy cluster. Chandra, the South Pole Telescope, and 8 other telescopes combined to study Phoenix, which is the most powerful producer of X-rays of any known cluster, and among the most massive of clusters. The image on the left shows the newly discovered Phoenix Cluster, located about 5.7 billion light years from Earth. 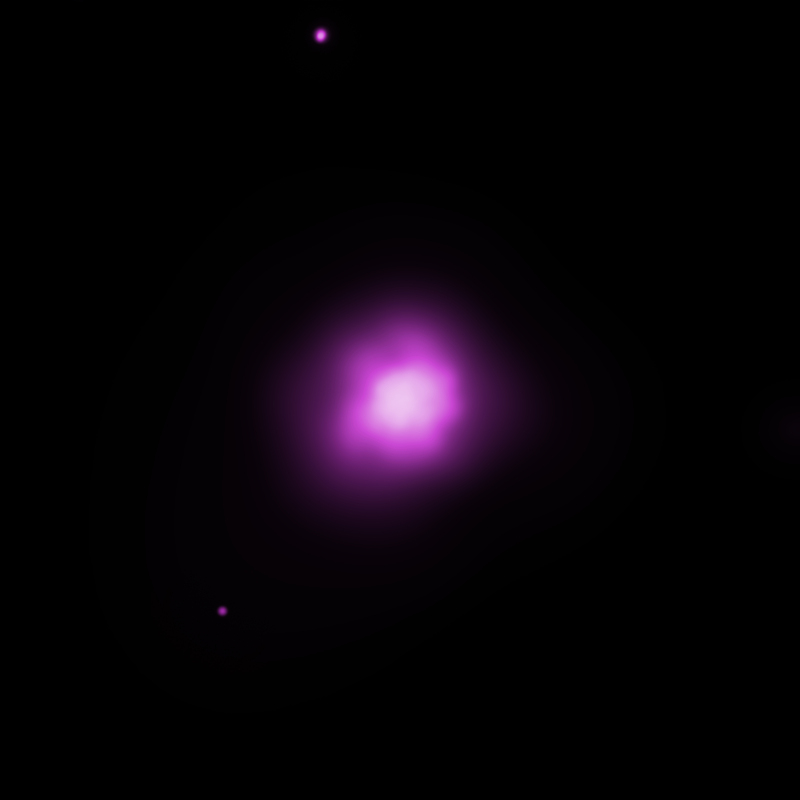 This composite includes an X-ray image from NASA's Chandra X-ray Observatory in purple, an optical image from the 4m Blanco telescope in red, green and blue, and an ultraviolet (UV) image from NASA's Galaxy Evolution Explorer (GALEX) in blue. The Chandra data show hot gas in the cluster and the optical and UV images show galaxies in the cluster and in nearby parts of the sky. This galaxy cluster has been dubbed the "Phoenix Cluster" because it is located in the constellation of the Phoenix, and because of its remarkable properties, as explained here and in our press release. Stars are forming in the Phoenix Cluster at the highest rate ever observed for the middle of a galaxy cluster. The object is also the most powerful producer of X-rays of any known cluster, and among the most massive of clusters. The data also suggest that the rate of hot gas cooling in the central regions of the cluster is the largest ever observed. Like other galaxy clusters, Phoenix contains a vast reservoir of hot gas -- containing more normal matter than all of the galaxies in the cluster combined -- that can only be detected with X-ray telescopes like Chandra. This hot gas is giving off copious amounts of X-rays and cooling quickly over time, especially near the center of the cluster, causing gas to flow inwards and form huge numbers of stars. 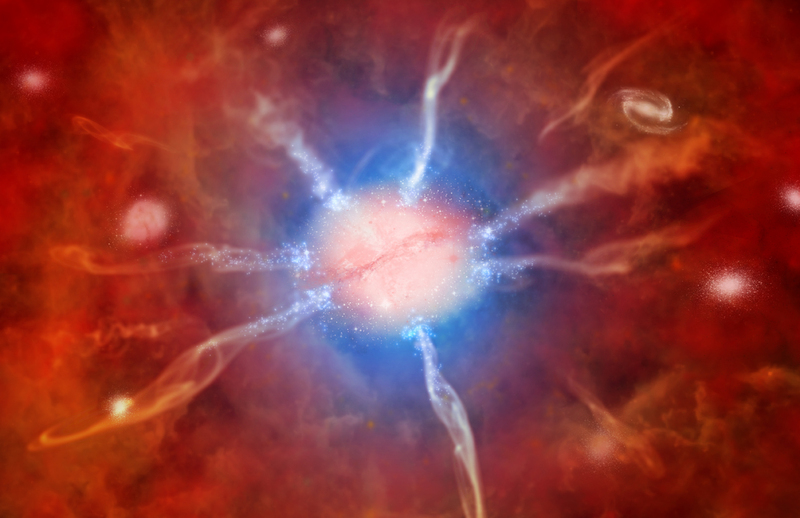 These features are shown in the artist's impression of the central galaxy, with hot gas in red, cooler gas in blue. The gas flows appear as the ribbon-like features and the newly formed stars are blue. An animation portrays the process of cooling and star formation in action. A close-up of the middle of the optical and UV image shows that the central galaxy has much bluer colors than the nearby galaxies in the cluster, revealing the presence of large numbers of hot, massive stars forming. These results are striking because most galaxy clusters have formed very few stars over the last few billion years. Astronomers think that the supermassive black hole in the central galaxy of clusters pumps energy into the system. The famous Perseus Cluster is an example of a black hole bellowing out energy and preventing the gas from cooling to form stars at a high rate. Repeated outbursts from the black hole in the center of Perseus in the form of powerful jets, created giant cavities and produced sound waves with an incredibly deep B-flat note 57 octaves below middle C. Shock waves, akin to sonic booms in Earth's atmosphere, and the very deep sound waves release energy into the gas in Perseus, preventing most of it from cooling. In the case of Phoenix, jets from the giant black hole in its central galaxy are not powerful enough to prevent the cluster gas from cooling. Correspondingly, any deep notes produced by the jets must be much weaker than needed to prevent cooling and star formation. Based on the Chandra data and also observations at other wavelengths, the supermassive black hole in the central galaxy of Phoenix is growing very quickly, at a rate of about 60 times the mass of the Sun every year. This rate is unsustainable, because the black hole is already very large with a mass of about 20 billion times the mass of the Sun. Therefore, its growth spurt cannot last much longer than about a hundred million years or it would become much bigger than its counterparts in the nearby Universe. A similar argument applies to the growth of the central galaxy. Eventually powerful jets should be produced by the black hole in repeated outbursts, forming the deep notes seen in objects like Perseus and stopping the starburst. The Phoenix Cluster was originally detected by the South Pole Telescope, using the Sunyaev-Zeldovich effect, as explained in more detail in a blog interview with the first author of the paper, Michael McDonald. In a separate article more details about the Sunyaev-Zeldovich effect are given, including a historical perspective, in an interview with one of its co-discoverers, Rashid Sunyaev. Observation Time 3 hours 20 min. It's time to consider that these filaments - which Herschel has in other instances correlated with stellar birthing - are really just plasma filaments. The stellar birthing process appears to simply be a transient electrical process which then spins off stars, much like ball lightning is produced here on Earth. The accretion process is not fundamentally gravitational - which is of course a radial process. There is a process from the plasma laboratory known as Marklund convection which can explain what we are seeing here. Impressive how little we know about the universe. Projects like this is what keeps my hope in mankind from dying. A question for the authors, if I may. Do the authors have any ideas about the spectral types of stars that are being formed in the Phoenix cluster . Are they likely to be O, B stars, a mix of all spectral types, or just the lower spectral types e.g. A through G? Tremendous! The amount of information on all of NASA's sites is stunning. I have noticed that they have recently changed the look and the info is targeted to people who may not have a great deal of math. Not as technical. Anyway it is providing more information in an easier reading format. BRAVO! Great Job!!! The system of eight to ten jets blasting out equatorially is almost like the energy switching system in the cilia tail segment in Nature 463, 21 January 2010 on page 308. It shows to have nine-bulb ended radial conductors being fed EM energy from the central rotating electron-signature-circle, as an opposed one of the two induction zones approach one of the nine conductors. Perhaps Mother Nature is more economical in her use of systems that work than even I had imagined. Could this not be from a galactic collision event where the colliding galaxy is coming from behind the plain of the observed "phoenix" galaxy? Considering the angle of entry (absorption) of galaxies by the black hole, it may be that the jet energy to go behind it (black hole) that could be investigated. On the other hand, if no energy dispersion, will be a huge BIG BANG able to change the region of millions of light years around it. WOW fascinating. Energy is so beautiful and highly powerful. looking forward to find new discoveries about this Phoenix Cluster. A Black Hole in Perseus at 2,1 ly Seems to be Found. Are there Pictures of it? A galaxy cluster, whose official name is SPT-CLJ2344-4243, located about 5.7 billion light years from Earth. X-rays from Chandra, optical from 4m Blanco telescope & UV from GALEX. Image is 5.6 arcmin across (7.3 million light years across).